I've mentioned many times before that my great love for my Kindle stems almost entirely from the massive, obscure, esoteric and fabulous free library that is at my disposal through Project Gutenberg. 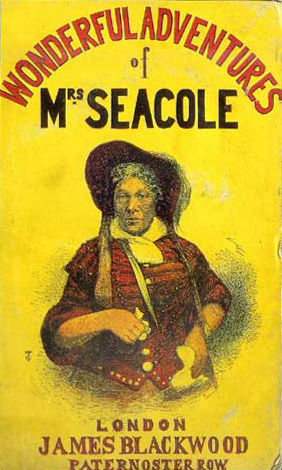 I often look through the Gutenberg website specifically for memoirs written by women, and I came across The Wonderful Adventures of Mrs. Seacole in Many Lands in exactly this manner. Mary Seacole was a mixed race woman born in Jamaica in the 19th century. She was married and widowed young, and never remarried, instead running several hotels throughout the Caribbean and becoming a very capable nurse. When the Crimean War started, she decided to take her healing skills to the front and took on a substantial loan to travel from Jamaica to England and then to the Crimea to open a hotel and tend the soldiers there. She was a very strong, determined and fascinating woman and I was so excited to read about her. Ana from things mean a lot read the book, too, and below is the first half of our conversation about the book (and a much more general conversation that stemmed from the book but doesn't relate directly to it). For the second half of the conversation, visit Ana's blog- it has a lot of the good bits on a woman's place in Victorian England and the fine line between what we say drives us to do things and the motivation that actually does drive us. I hope you enjoy it! Ana: There was something that took me aback me when I started reading The Wonderful Adventures of Mrs. Seacole in Many Lands: a quick glance at Mary Seacole’s biography reveals that she lead a very unconventional life for a mid-Victorian woman. Her professional role as a nurse was one that fit into gender expectations of women as caregivers, but nevertheless she was a career woman rather than a family woman; she was widowed at a young age and didn’t marry again; she defied expectations and challenged gender and race stereotypes to achieve what she wanted. And yet in many ways she was a conventional Victorian. Of course, I don’t mean to imply that anyone who deviated from social conventions throughout the course of history must had have a contemporary mindset - I realise that’s a simplistic and reductive way of looking at the past. But with Mary Seacole in particular, I was still a little surprised that having been the target of prejudice, for example, didn’t stop her from being prejudiced in her turn. But then again, that’s how we humans very often work; the world would be a much less complicated place if that wasn’t the case. Aarti: Yes, you’re so right. She was pretty prejudiced against people from other countries, wasn’t she? I know I am probably just very sensitive about it, but I noticed in particular her dislike for Americans. Sadly, though, I am not surprised that being a target of prejudice didn’t stop her from being prejudiced. I think it’s been proven many times that those who are looked down upon by one set of people need to have another set of people to look down upon themselves. That sentence may not make any sense, but it’s been pointed out a lot when describing race relations in the US in particular. Jim Crow, for example, was really carried out by low-income whites, mostly so they could say, “Well, I may be poor, but at least I’m not Black.” And the economic make-up of the Tea Party today, for the most part, is poor people just above the poverty line who, if they had any sort of slip, would then qualify for and receive the benefits of welfare. But because they are not quite on welfare, they look down upon those who are and feel better about themselves. In many ways, I think prejudice will always be with us as a way of dealing with our insecurities, and as a mixed race woman, I imagine Mary Seacole had many insecurities and those came out through prejudices. Actually, what really surprised me about Mary was how English she considered herself. Really, she felt compelled to be a nurse in the Crimea so that she could be “useful to [her] own sons, suffering for a cause it was so glorious to fight and bleed for!” It really amazed me that she thought a lot of men hundreds of miles away from her, fighting a war that really didn’t have anything to do with her, were so close to her that she should help them. And she really believed that the war was a worthy one- glorious, even. That belief and pride in the English empire really just floored me. The disappointment seemed a cruel one. I was so conscious of the unselfishness of the motives which induced me to leave England—so certain of the service I could render among the sick soldiery, and yet I found it so difficult to convince others of these facts. Doubts and suspicions arose in my heart for the first and last time, thank Heaven. Was it possible that American prejudices against colour had some root here? Did these ladies shrink from accepting my aid because my blood flowed beneath a somewhat duskier skin than theirs? Tears streamed down my foolish cheeks, as I stood in the fast thinning streets; tears of grief that any should doubt my motives—that Heaven should deny me the opportunity that I sought. Then I stood still, and looking upward through and through the dark clouds that shadowed London, prayed aloud for help. I dare say that I was a strange sight to the few passers-by, who hastened homeward through the gloom and mist of that wintry night. I dare say those who read these pages will wonder at me as much as they who saw me did; but you must all remember that I am one of an impulsive people, and find it hard to put that restraint upon my feelings which to you is so easy and natural. But of course, even here she's very tentative, and them immediately calls herself "foolish". Another thing that came to my mind as I thought about this some more was the example of many Victorian feminists: they were revolutionary several ways, and yet surprisingly stiff and proper in others, especially when it came to sexuality. I’ve read some sources that suggest that one of the factors that contributed to this was their knowledge that if they wanted to be taken seriously at all, they couldn’t afford to be unconventional in more ways than one. To be able to succeed as activists, they had to be absolutely proper and respectful in all other areas of their lives. I wonder if to some extent that was also the case with Mrs Seacole - I wonder if she picked her battles and avoided stirring the pot in more ways than necessary, lest she lose everything she fought for. Do you have any thoughts to share on this? Did the facts of Mary Seacole’s life lead you expect a different sort of person too? Aarti: Oh, that’s such an interesting (and sad) idea - that Victorian women had to choose the ways in which they were unconventional. I suppose that is still pretty true to this day, except that our definition of convention has broadened a lot. I think what frustrated me about this book was that we got so little of Mary Seacole in it. So much of the book was her just listing all the accolades she’d gotten from men in the field. It was so funny, really, that she kept telling us that she wasn’t the bragging sort, but then half of her journal was just about how amazing everyone thought she was. I wanted more of Mary herself. She must have faced racism while acting as a nurse- why doesn’t she ever mention that? And she was a woman far from home, in completely alien circumstances - why don’t we get any deeper feelings from her? What did she do for fun? Who were her friends? Did she leave the Crimea still believing that the war was fought for a glorious and wonderful reason? Did she still think of herself as English? Did she feel that everyone else considered her English? Was she lonely, probably being the only person for miles and miles around who looked the way she did? I just wanted so much more depth than she gave us, and we got nothing. I think you could be very right about Victorian women in general and Mary Seacole in particular. Maybe she wrote this journal to fight her battle - Yes, I’m a colored woman from Jamaica, but I have useful skills and I am going to TELL you how I helped your people in a way that very few others could have. In a way, then, the journal is her vindication and in that way, it makes sense that she left out any of her deeper feelings and resentments and dismay- she didn’t want people to judge her as unpatriotic or unwomanly, but wanted her story and accomplishments to stand out as the only things of import. Which I suppose is great for her, but not particularly useful to us as modern readers really trying to get a grasp on what must have been a truly remarkable life, with nothing but a laundry list of patients helped to sort through. I think what I expected from this book was a fighter’s story. I wanted a spitfire woman who defied convention, went her own way, was extremely blunt in her manner, and who clawed her way to the front and then won the hearts of an army with her amazing healing skills. And I can’t help but think that is what Mary Seacole was, but that she hid all of that under a proper veneer. The racism that came out so often was so jarring. It was so hard to reconcile the picture of a nation stripped of resources by a colonial power with that of a woman who had those same imperial prejudices, even though she saw and experienced the effects of imperialism. I never read the book, but I saw a movie adaptation of Small Island, which is about Jamaicans that move to England. They think that they will be invited in because they are all part of the same country, and have the same culture, and London is the epicenter of this fantastic community that everyone participates in - but then they go to London and realize that they are not the same. That people do not consider them English, and that they are outsiders. And it’s very, very difficult for them to come to terms with that. We never got to see that eye-opening experience with Mary Seacole, and I think the narrative is the weaker for it. Instead, I can’t help thinking that she either refused to see what was around her, or just left those sections out of her reminisces. Or maybe I’m wrong, and she really was welcomed with open hands. I don’t know, but the journal seemed so empty of the personality I expected to inhabit it, and I couldn’t really get over my disappointment about that. Ana: Like you, I expected Mrs Seacole's voice to be far more personal than it actually was. But instead of intimacy, we got a memoir that feels a little like a public speech; like a lecture in a Victorian hall. There's no denying the fact that this disappointed me as much as it did you, but I keep thinking about the possible reasons behind this choice. I do think the propriety and public speech tone weaken her narrative, but maybe this is one of those cases where we have to struggle to find whatsoever insight we can in what she's not telling us. After I finished the book I read a little bit more about her online, and I learned that she borrowed the money to go to the Crimea and that was why she returned ruined. This has fascinating implications about her motivation and sense of duty to the British Army, as you mentioned above. As she hints at towards the end of her memoir, she came back from the Crimea in dire need of money, and I read that writing this book was part of an ongoing effort to keep her in the public consciousness and to fundraise to help her out of debt and make sure she had a living. So in a way, this book was propaganda to serve a cause, which helps explain her "I don't want to brag, but look how helpful I was" tone. If we keep this in mind, I think her efforts not to denounce any racism of express unpatriotic thoughts make a lot more sense. Of course, my frustration as a modern reader doesn't go away because of this, but I can understand that she literally couldn't afford to alienate people - she needed the public's favour in order not to starve, and so she couldn't say things that most people wouldn't want to hear. We have gone on at length about what we expected to get out of this memoir and didn't, but there are also interesting things we did find. So I thought I'd ask you what you liked about Mary Seacole's narrative. What were some of the things that interested you the most? Click here to see the rest of the conversation on Ana's blog! Thanks for doing this with me, Aarti :) I had a lot of fun. I have never heard of this book before, but an interesting discussion so far! Yes, it's one of those utterly obscure gems you find sometimes on Gutenberg! This was a really intriguing look at this book, and I LOVE that you guys did this together! I find this statement: "I think it’s been proven many times that those who are looked down upon by one set of people need to have another set of people to look down upon themselves" is so, so true,and also very perceptive. In my reading of Howard Zinn's A People's History of the United States, this was a prevalent component of slavery and the misconception that there needs to exist some sort of hierarchy among humans. This sounds like something I would like, and that I need to download right away. YES, very much so. I am glad I convinced you to try this one as you've convinced me to try Howard Zinn. Seacole sounds an extremely interesting character. I do like the unique blogging approach you have taken with a conversation about book. Thanks, I really enjoy buddy reads and reviews, too! Ooh, I'm so glad you are looking into those! I would love to discuss with you when you're done!